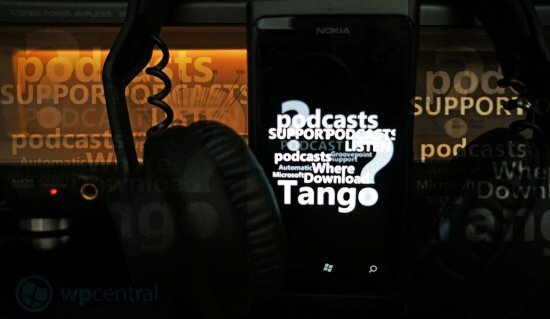 Over the air podcasts gone from Windows Phone after Tango update? Listening to podcasts on the go is one of my favorite pastimes, a great way to catch up with the latest news or a special interest. For those of us who reside outside of North America, podcast support has been a bit limited to say the least. Unlike our pals in the US, we cannot subscribe to podcasts through the marketplace on either Zune desktop software or directly using the phone. Annoying, but Mango at least introduced a half-workable solution. Unfortunately, after the Tango update it’s no longer possible to use that either. To subscribe to podcasts prior to Tango, first we needed to set them up in the Zune desktop suite. Once subscribed, simply plugging in the phone and synchronising would pass the podcast to it. Podcasts would the automatically download without further PC interaction. Alas, this is now not the case. What’s going on? Before, some conditions needed to be met to download over the air: the device had to be both plugged in and connected to Wi-Fi before the podcasts would update. Sometimes the device would not run the task to check for updates. Thankfully from the podcast menu we could manually check for updates, bringing up a list of podcasts. That would normally be enough of a kick to get the phone to check for updates. To be frank, this system wasn’t perfect but most of the time it would result in a recent podcast becoming available as you flew out the door. Series settings and unsubscribe options available on a Mango device..
During the last week or so I managed to get the chance to resubscribe to my favorito podcasts on my Lumia 800 since applying the Tango update. I had a long car journey to get through and was quite excited to listen to a few podcasts along the way. I checked my device in the car only to find all the podcasts were out of date. "Ah ha!" I thought, "my car is close enough to the house to be on Wi-Fi. I can just plug it in and check for updates." No such luck. That ability is no longer there, so I cannot get the phone to check for later podcasts. In fact, it simply does not update the podcasts under any conditions. 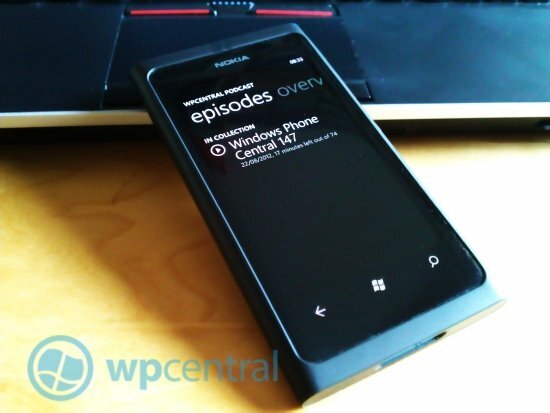 Why is podcast support on Windows Phone so bad when it should be so good? Many of us have been asking this question almost since the arrival of Windows Phone. 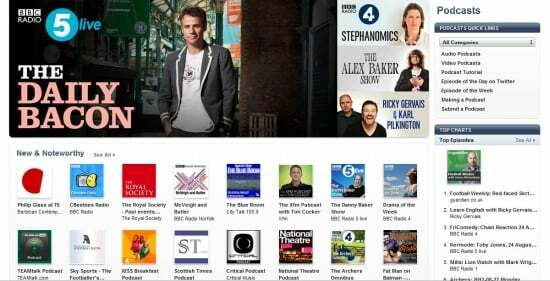 For a great many users, it is simply not possible to browse and subscribe to podcasts from the Marketplace. The Zune desktop software is geo-fenced. It’s possible to trick it into showing the elusive podcast support by changing the region, but a number of reasons make it an unworkable solution. We have to ask the question, "why is Microsoft making it impossible to get easy access to podcasts?" If you look at iOS devices, they have outstanding podcast support. They use it as a positive selling point. I mean, what better way to sell devices than with the lure of free content? Here in the UK, the BBC simply offers tons of amazing free content. The fruit themed company actively promotes this content to help bring value to their customers. The BBC also just released a dedicated app for podcasts, making browsing and subscribing to podcasts even easier. Do their customers love this? Yes! For some people it will be enough to bring them to the platform; it’s that good. Why break the already limited podcast support? I cannot understand the decision to further break podcast support in Windows Phone. If the platform is updating soon, surely tthe feature set should increase rather than decrease. From an OS level, it has needlessly become impossible to automatically retrieve updates to subscribed podcasts over the air. What is so bad about podcasts that Microsoft have gone out of their way to remove even the most basic of features? Perhaps the devices were not adhering to the Wi-Fi rule when getting new podcasts, leading to unexpected data charges. If this was the case, then why not officially document the feature's removal? Of course there is always the possibility Microsoft never intended to allow this type of behavior on Mango devices. What possible reason could they have to justify such a move though? As subscribing is a wholly manual affair for those outside the US it should present no legal issues, right? While investigating I came across this article on the Windows Phone website. It clearly states that subscribing to podcasts on your phone is not available in all regions. Yes yes, we get that. Above that though it mentions the 256 MB of RAM requirement being needed to manage podcasts from the phone. Could the Tango update have introduced a bug that makes the music software think less memory is available? Maybe, but if that were the case then folks in the US would have noticed their over the air updates stop too. US readers, please let us know if you've experienced similar issues in the comments below. That depends on what you want to achieve. Sure, there are plenty of third party podcast apps... Some will run in the background, allowing you to leave the app without interrupting the download. Will any of them provide the same core OS reliability to keep running that task in the background? Unlikely. Windows Phone also has oddities in the way the music hub works for 3rd party content that doesn’t make it a seamless OS experience. It will need to launch the third party app itself in order to play the content. Windows Phone 8 is on the way. With it, expanded scenarios for background downloading and listening could also come along. 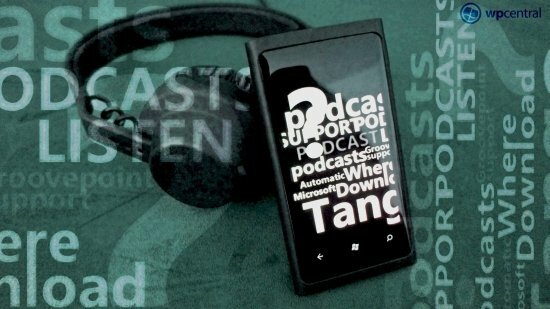 Whilst it’s a distant hope, it’s likely unrealistic to think MS will suddenly expand podcast support after crippling it in WP7.5. We only need to look at Windows 8 to see how highly MS regard podcasts: there is no podcast support at all built into the new PC OS. Having to power up a PC to download podcasts and then sync them with a Windows Phone is cumbersome and inconvenient - an extra step where there doesn’t need to be one. The reality of the situation is that MS have made podcast support dip to such a low that users like me are forced to consider platform alternatives. Podcast support is incredibly important to my needs. We would like to hear why podcast support has all but been dropped in Tango. We’d also like to know what you guys think about this situation. How on earth can we get Microsoft to take podcast support more seriously? Should the removal of a feature not be documented in some way? While we're at it, we’d love to know your solutions to these problems - be it third party apps or simply using another platform. We've reached out to Microsoft for clarification on the issue. In the meantime, leave a comment and let us know what you think.